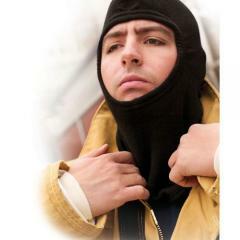 Double ply hood throughout; Designed to provide coverage of the neck, upper chest and to the top of the shoulder blades; 3 inches longer in front than NFPA requires for firefighter hoods; Shoulders are contoured to reduce bunching of the bib; Flate-stitched seams; X-Heavy 1/2 inch wide elasticized face openings; Cover stiched bound drape. Hood is UL Classified and is compliant to the NFPA 1971 - 2000 edition. This high quality firefighter hood is made of Carbon Shield material. Carbon Shield is a flame-resistant fabric based on carbon fire technology that: Is non-flammable and melt-proof; will glow, but not burn in extreme heat or flame; deposits no tar; retains a certain tenacity at certain tenacity at temperatures exceeding 2300°F for 90 seconds; has low-heat conductivity; is over 20% lighter than most NFPA-compliant hoods, yet has an excellent Thermal Protection Performance (TPP) rating of 28; will remain supple and soft after exposure to fire, as well as repeated washing and drying; allows 200% stretch and recovery; will not fade or weaken when exposed to UV rays; has excellent moisture regain; can neutralize unpleasant odors due to the carbon fibers; these firefighter hoods wick moisture away from the skin to the outer shell enabling rapid evaporation for increased comfort and protection.